Panasonic showed at the IFA 2010 in Berlin some interesting new products tostore energy at home. These products are a result of a remarkeble change in Panasonic’s strategy, as announced begin of this year. The move focuses on solar-panel and energy-storage technology. Storing energy created with solar power generators and fuel cells, until you need it – this is the basic concept of ideas that “store energy” and is an indispensable element of producing and consuming energy locally. 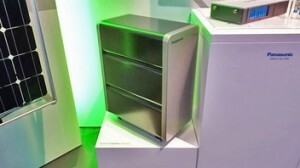 At the IFA Panasonic shows lithium-ion storage battery, which boasts the world’s top share, and the direct methanol fuel cell (concept model). The lithium-ion storage batteries on exhibit is a unit module comprised of lithium-ion batteries of size 18650 (diameter 18mm x height 65mm), the most commonly used size around the world (used for e.g. notebook PCs). The combination of battery modules gives way to various applications. For example, if you use 6 such modules, it can be used as a residential storage battery. More batteries can be combined to meet the electrical needs of larger buildings. 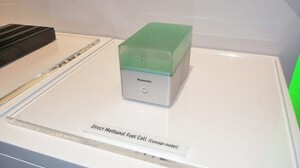 There is also a direct methanol fuel cell (concept model) on exhibit. It is compact (the same size as a small speaker), which might come in handy in places where electricity is not available, e.g. cottages up in the mountains or construction sites.